I woke up pretty late this morning and with 20 minutes to put something together, I didn't really think much about what I was wearing. All I knew in my sleepy state was that I wanted to be comfy and though it was awfully cold in the morning, I'd be potentially too warm later in the day. And so out of the wardrobe came this combo which is odd but thus I'm quite loving. 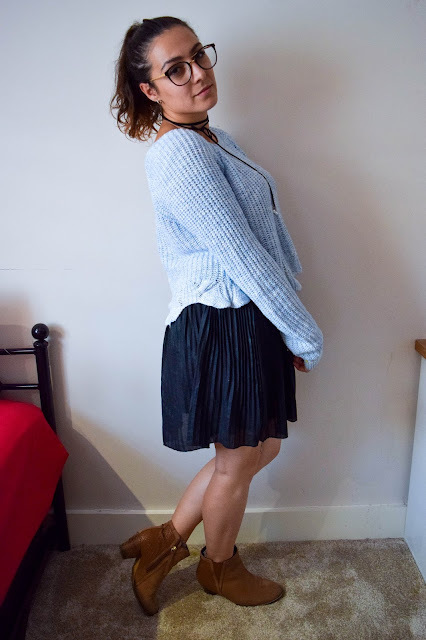 I've always adored that pleated skirt with the chunky jumper tucked in but I didn't think it'd really suit me, or if not I wasn't pairing up the right pleated skirt with the right jumper. Every time I tried that with this skirt, it looked too bulky and silly. But I'd never given the cropped jumper a thought and so I chucked it on quick out of curiosity and desperate to be comfy but look smart in some way which is why I wanted to wear this particular skirt. (This skirt is the smartest one in my wardrobe atm that fits.) 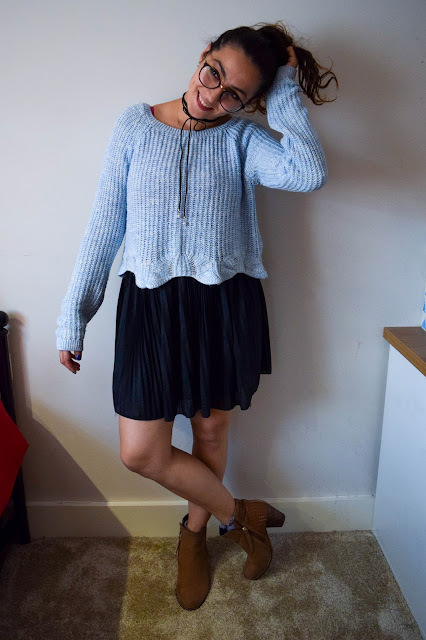 I feel like the way the scalloped hem falls on my jumper sits in a good place for it to work with this skirt and compliment each other well despite the contrasting textures. I love the layered look but I always worry about it looking too bulky. I do think I look somewhat bulky here but in a comfy way like I expected it to. Of course I added some accessories to jazz it up and I've been trying to re-shop my jewellery stash an wear it a little more recently. 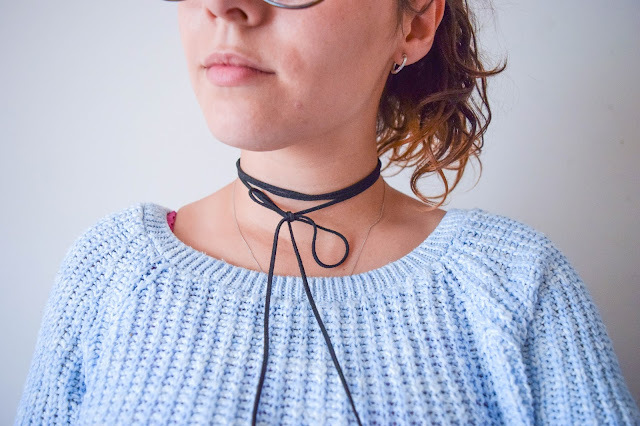 I came across my wrap-around choker and thought it would be nice with my layered look. As much as I like how this look turned out, I feel like I need to get into those darker colours for autumn now. 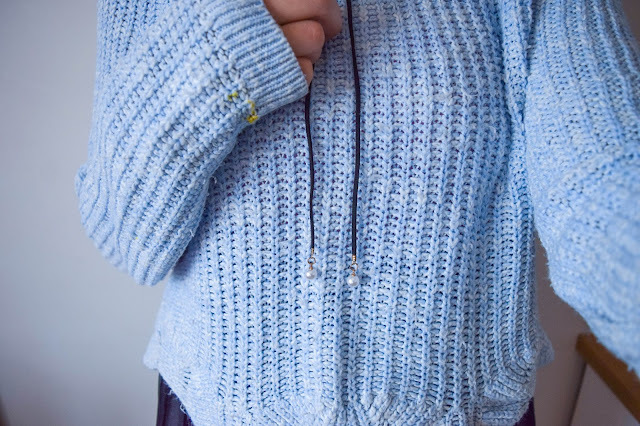 I'm ready to embrace the cold and though this jumper is a lovely transitional summer-autumn piece, I've fallen out of love with blues for now and it feels too much of a cool colour for my current wardrobe go-to's. I'm really loving yellows, red and oranges so I'd love to inject those into my wardrobe now. This does have to be one of my favourite jumpers though and at about 3 years old it still is! I might not be digging blue a lot but it doesn't stop me loving it. It's one of those "I'll only throw it away when it starts to fall apart" pieces. And I worry because the sleeves are coming a little undone already. Have you got any much loved pieces in your wardrobe at the moment? Share with me in the comments what they are and why you love them so. 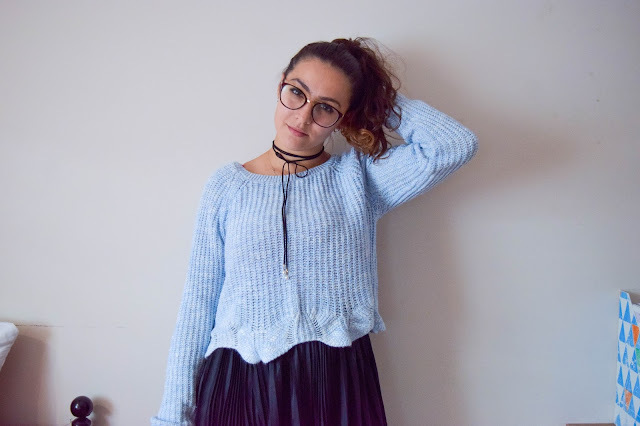 Looking super cute in blue Cat! Wishlist | Can I Wear Jumpers Yet?